Danny Lyon was born in 1942 in Brooklyn, New York. He is an American photographer and filmmaker. All of Lyon’s publications work in the style of photographic New Journalism. He is the founding member of the publishing group Bleak Beauty, after being accepted as the photographer for the Student Nonviolent Coordinating Committee (SNCC). Lyon was present at almost all of the major historical events during the Civil Rights Movement. 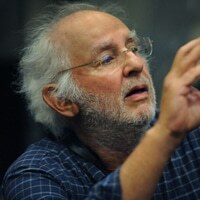 A filmmaker and writer, Lyon’s films and videos include Los Niños Abandonados, Born to Film, Willie, and Murderers. He has recently published The Story of Sam and the non-fiction book Like a Thief’s Dream. His latest publication, Burn Zone, is an attack on climate-change deniers. Lyon recently completed the sequel to his film Willie, and the first comprehensive retrospective of his career – Danny Lyon: Message to the Future – premiered at the Whitney Museum of American Art in New York, exhibited at the De Young in San Francisco, and at C/O Berlin. He has had solo exhibits at the Whitney Museum of American Art, the Art Institute of Chicago, the Menil Collection, the M.H. de Young Memorial Museum in San Francisco, and the Center for Creative Photography at the University of Arizona. Lyon twice received a Guggenheim Fellowship, as well as a Rockefeller Fellowship, the Missouri Honor Medal for Distinguished Service in Journalism, and a Lucie Award.